Baldwin (d. 1190) was born in Exeter, and had a rapid rise through the Church hierarchy: he became a priest and archdeacon in Exeter, a Cistercian monk and very soon after, abbot, at Forde Abbey (between Chard and Bridport, in Dorset); bishop of Worcester, and finally archbishop of Canterbury. He went on Crusade and died in the Holy Land. 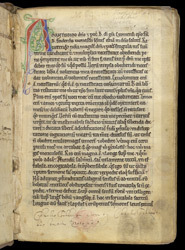 This copy of his treatise on the sacraments was owned soon after it was made by the Abbey of Holy Cross, Waltham, a short distance due north of London. The first line of the text refers to '. . . B[artholomew], by the grace of God Bishop of Exeter; brother B[aldwin] of Forde monastery . . .'. The top line of the page has been left blank for a rubric, which was never inserted.